Here’s a recent Advertising Food Photo I did for a local grocery store chain. I really like this shot and wanted to share it with you. The Art Director’s name is Matt and he is amazing. I love his style of directing. He points you in a direction and then diplomatically keeps you on track if you stray too far from what he wants. 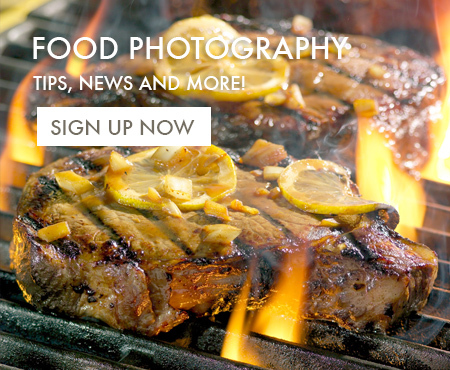 Food Photography, especially Advertising Food Photography, is a team sport. The Art Director, the Food Stylist, the Prop Stylist, and the Food Photographer all work together to come up with the end result. I like the composition. As a team, we debated the way everything was weighted to the top right, but looking at it now, I think it’s perfect. We could use this shot as a perfect example of an “S-Curve” composition. I love it. The lighting might be a tad flat, but maybe not. The shot in general is high key, so it’s hard to add too much shape on things when there’s so much light flying around. To me, breakfast shots need to be bright and bright usually means flat. 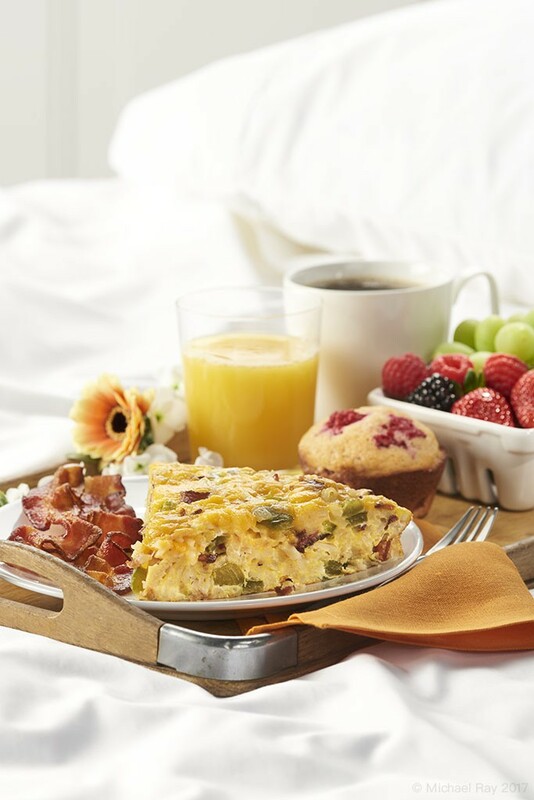 Another thing I really like is the “glare light” on the top of the egg, the bacon, and the OJ. I think that those highlights add to the “light and airy” look that makes the photo so successful. They say that hindsight is twenty-twenty and that’s especially true with Advertising Food Photography. That’s why I try to pause right before I hit the shutter, on what I think is the final photo and ask myself “how can I make this better”? With this shot, I think I got almost everything I really don’t like. It’s more of a retouching issue, and I know about it before I click the shutter that final time, but the base of the muffin needs to be cleaned up a little. I considered spinning the thing, but I really like the arrangement of the particulates on top, so I left it there and then forgot to retouch it. Hopefully, the client will have caught that. The only other thing that bugs me a little about the shot is the way that the pillow tends to blend with the sheet. If I had to do it over again, I would put a little space on the far left, underneath the pillow’s corner, just enough to help define the separation of the two objects. I think it loose good now, but that would improve the shot a little. All in all though, I’m very pleased with this Advertising Food Photography shoot. identify what they were at a glance.. If the Art Director likes it then it must be good.. Here in La Paz Mexico there are no art directors and they have not advanced much beyond “just click it and go to the next shot”. But that is another conversation.. Thanks for your blogs, You have taught me so much and I have progressed much farther than I would have without you..